Moroccan Cleanse is on my go to list at the moment. It is basically a body wash for those that have a faux glow. It hydrates and balances the skin therefore extending your tan. 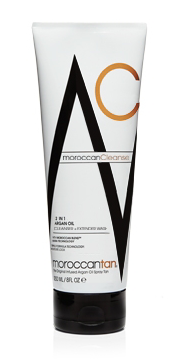 Moroccan Tan really do have a focus on skin health and I think this is what sets them apart from other tanning brands…if the skin is soft, supple and hydrated then your spray tan is going to last SOO much better than if it is dry and dehydrated. All of their pre and post products have that focus and this one is no exception. It has Argan oil and Rosehip oil which is rich in natural antioxidants and essential fatty acids. Helps skin retain its youthful glow, reduce fine lines and provides deep moisture and hydration. It also has aloe vera which contains Bit A, B1, B2, B6, B12, Vit C and E and Folic acid. It hydrates and sooth the skin. Raspberry seed oil is emollient, lubricating and condition on the skin and helps with moisture retention. Lastly Vitamin E helps to protect and repair skin. Relieves dryness and promotes healing. The combination of all these things is what leaves the skin feeling amazing and with its light honey scent just makes you feel amazing. Loving it! and Loving the price of under $20! In studio now.